From the moment she appears on stage to the close of the opera just after the heroine’s death, Kasarova dominates the stage with her amazingly nuanced mezzo and her mesmerizing charisma. This is no brazen gypsy girl who turns men’s heads with a toss of her black curls and a sway of the hips; this is a modern, self-confident woman who knows exactly what she wants. This Carmen doesn’t need castanets to express her passion: it glows from within. She has a partner of equal stature in Jonas Kaufmann’s Don José, who, in Matthias Hartmann’s production, believably undergoes a transformation from repressed mama’s boy to passionate, jealousy-crazed hothead. With “the looks and nonchalance of a rock star” (New York Magazine), Kaufmann is being handled as “arguably the greatest tenor of the past 50 years” (The Guardian). The Zurich production is Kaufmann’s second stage version of Don José, following his role debut in London, which was greeted with standing ovations. 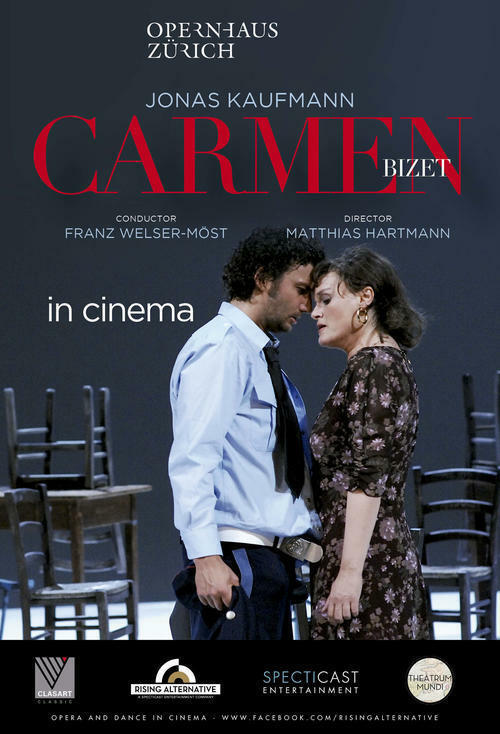 In the orchestra pit, conductor Franz Welser-Möst highlights the crisp, French contours of Bizet’s 1875 opera rather than its Mediterranean sensuality, weaving a transparent texture that is an ideal foil for the emotional density of the vocal parts. Caressing the soloists’ voices, the orchestra of the Zurich Opera seems to respond almost improvisationally to the many subtle shadings of the protagonists, especially Kasarova’s.